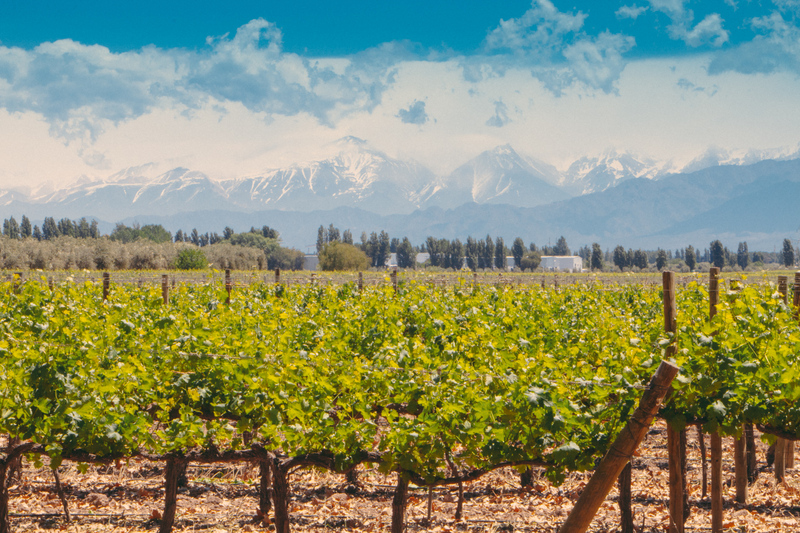 We got to Mendoza after an 18 hour bus journey from Bariloche. We slept fairly well on the bus and got to our hostel (Punto Urbano) around 10am so still had time to take advantage of their morning breakfast; a typical ham/cheese and dulce de leche affair. 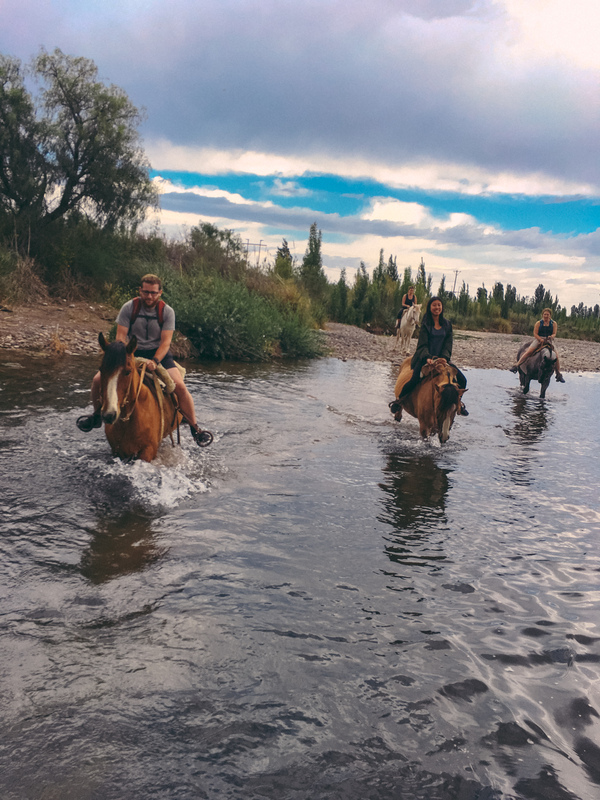 Whilst chilling over breakfast we began to plan our day and decided on the sunset horse ride which included an argentine BBQ. I went to book at the front desk but unfortunately was told it requires a minimum of 4 people – I told Alis this news and we began rethinking; as we did an American lady that was sat on our table gave a quick hello and said she apologises for overhearing but she’d be interested in the horse riding along with her friend. 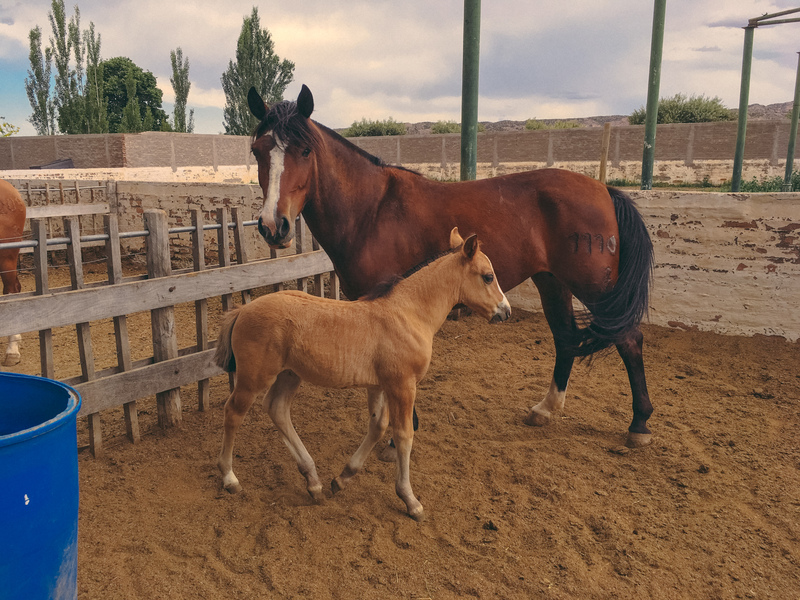 Perfect, so the horse riding was go for 4pm, we checked into our rooms, showered relaxed and then got picked up by the horse ride tour operator and taken to an area of Maipu. The farm where we started the tour was lovely, peacocks, dogs and cute puppies were roaming around, as well as paddocks full of horses and foals. The owner of this farm is a veterinarian so he takes in a lot of old animals, it felt like a really friendly and homely farm. 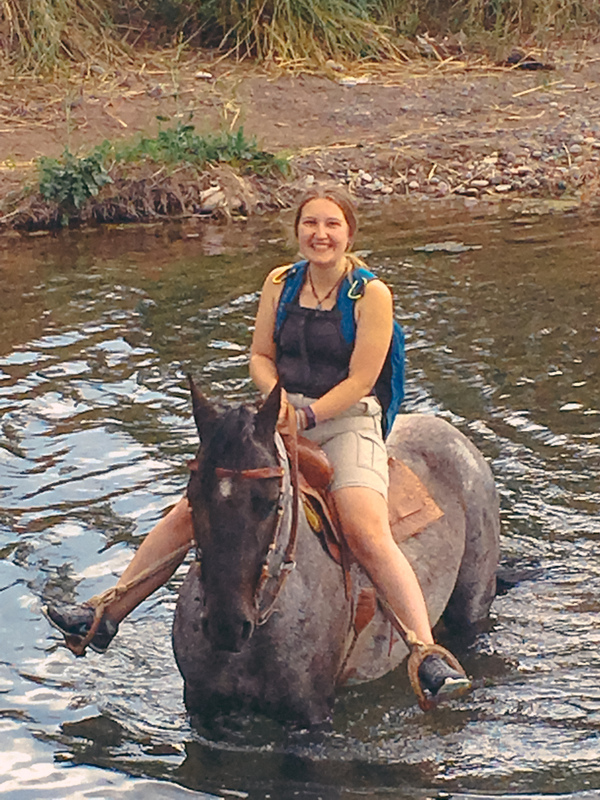 After our guide rounded up 4 suitable horses as well as saddles and reins fitted, we began. Our instructor chose me as the first person to get on, bearing in mind I don’t ever recall being on a horse nor did he give any instruction, I managed to jump on successfully first time. 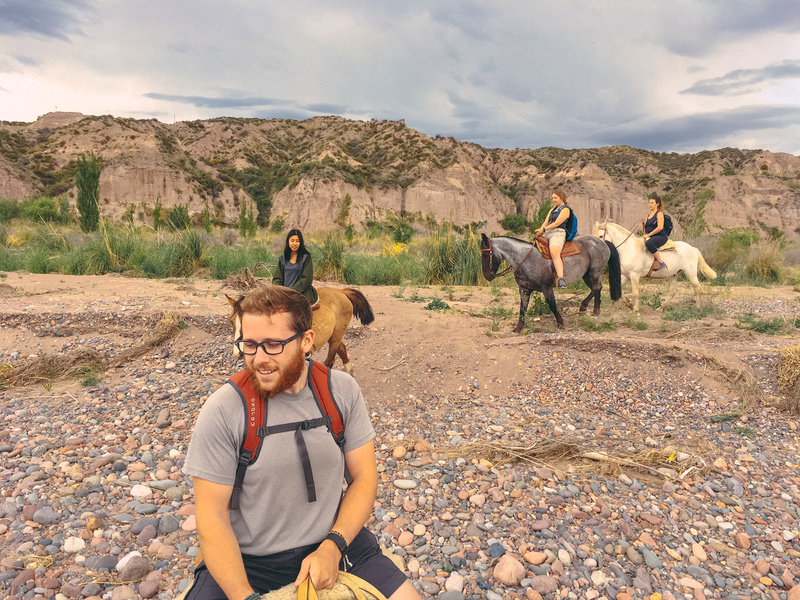 We had no helmets and no real instruction apart from the basics of the reins but it didn’t feel unsafe. The other 2 girls and then Alis all got on with ease and off we trotted. We did a basic walk for around 20 minutes down a country road and then reached an area of open land, here we had started to feel comfortable on our horses and our instructor began to push us further, we crossed a river that was deeper than all of the horses legs, our shoes got wet and it was fairly scary feeling the riverbed rocks slip beneath the horses feet and then having to climb a steep bank out of the river. We all crossed successfully and continued across a mix of grass and rocks for a while, by this point I was really enjoying myself, I never really liked horses or the idea of riding them, to me horses are just awkward skittish animals, but riding one was a completely different experience. The control of the reins reminded me of something else I’ve done in my life but I can’t put my finger on it, basically it felt like I just had to think what I wanted to do and it would happen. Just imagine going left, and the horse would do it, just the slight mental thought and the accompanying slight unconscious hand movement seemed enough. I think it might be motorbiking, when riding you don’t really turn with any force, you think, turn your head and the bike tends to naturally follow with your weight change. I was close behind the instructor and I think he sensed my confidence on the horse so asked if I’d like to try galloping, to which I said with a smile “of course”, we galloped only for about 20 seconds but it was exhilarating, probably made more fun by the feeling that at any second I could have fallen off as my feet weren’t very securely in the stirrups. From here we continued our walk across inclines, downhills and small rivers. And then disaster happened, after climbing a river bank with lots of loose pebbles Alis’ horse began to buck, we’re still not sure why but think a loose stone may have hurt its hoof or leg, it did a few smaller bucks and then a large one that threw Alis off to the side, she landed on her shoulder with a thump in a clearing of sand, incredibly lucky as this was the only 8 foot patch of sand in many metres of large rocks/pebbles. Within what seemed like a few milliseconds she had rolled out of the way of the horse and stood up. I still have the image in my head of her being flung and landing in that sand, my heart sank and the feeling is still a little indescribable – half sorry for her like a puppy that had just been kicked and half worried that she was okay. But alas, she shook herself off and carried on like a trooper. The rest of the ride was through country paths and across grass, the last 10 minutes we encountered thunder and lightning that made us slightly worried that the horses would bolt, but apparently they’re used to it. It wasn’t more than 3 minutes after we had stabled the horses that the rain began, and it really hammered down against the tin roofs and wooden beams of the farm buildings. 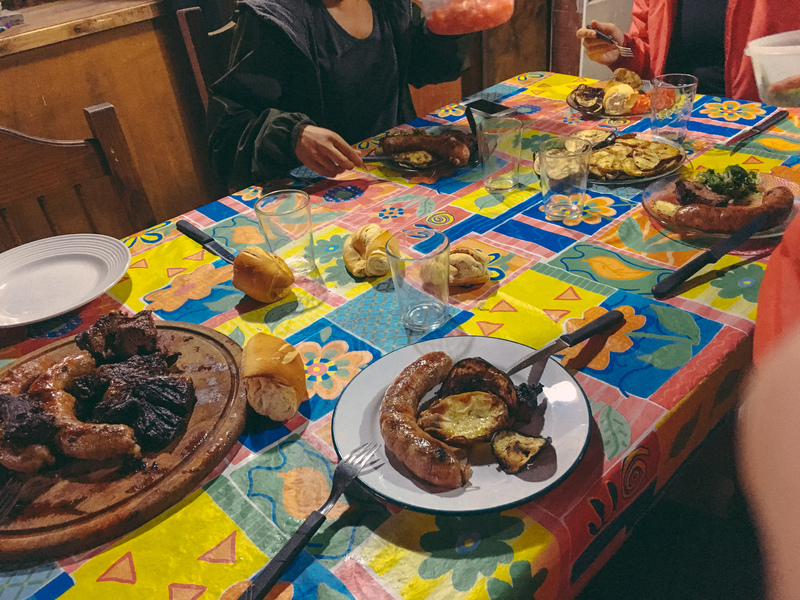 We tucked into our traditional argentine BBQ and Malbec served from a 2 gallon container and told travelling stories before bussing it back to the town, we were dropped off at a large craft store market in the plaza and walked around browsing for a while before heading back to our hostel. The next day we had agreed to go for a bike ride through the Mendozian vineyards, as we discussed it over breakfast a New Zealand couple approached and asked if they could kindly join us, of course we agreed and a while later the 6 of us set off, acquired a bus card and were on our way. 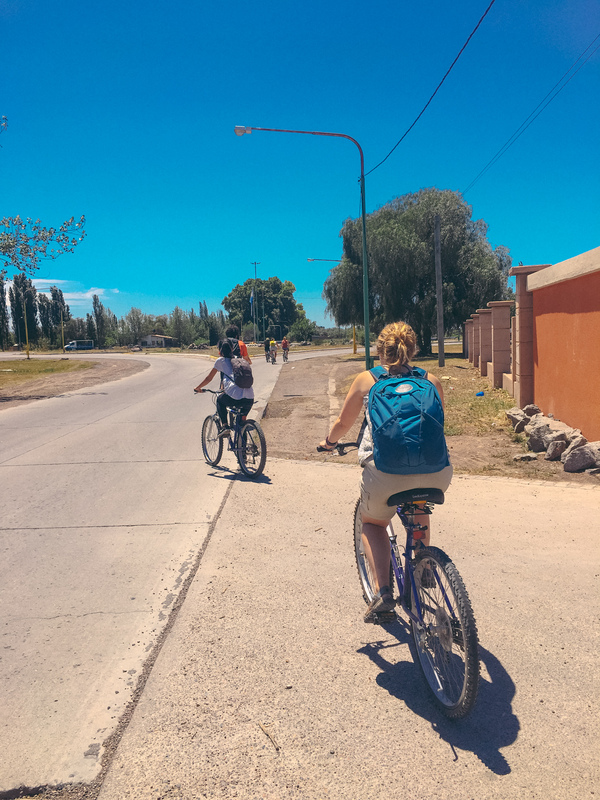 Our bikes were fairly simple and old but the roads were flat, albeit dotted with cracks and potholes. Our first vineyard visit was to Carinae Vineyard, we tasted malbecs, cabernet sauvignons and got told about the basics of wine creation and the history of the vineyard – previously it was a large production place, then abandoned then only a few years ago a french couple took it over and since have managed to create very good quality wine but purposefully stay small, agile and of high quality. 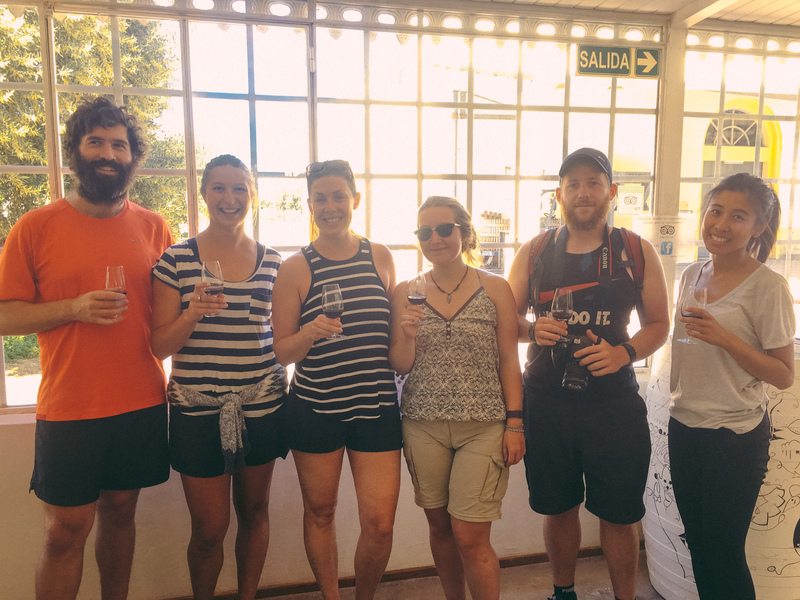 From Carinae we crossed the road to Olivicola Laur – an olive farm. 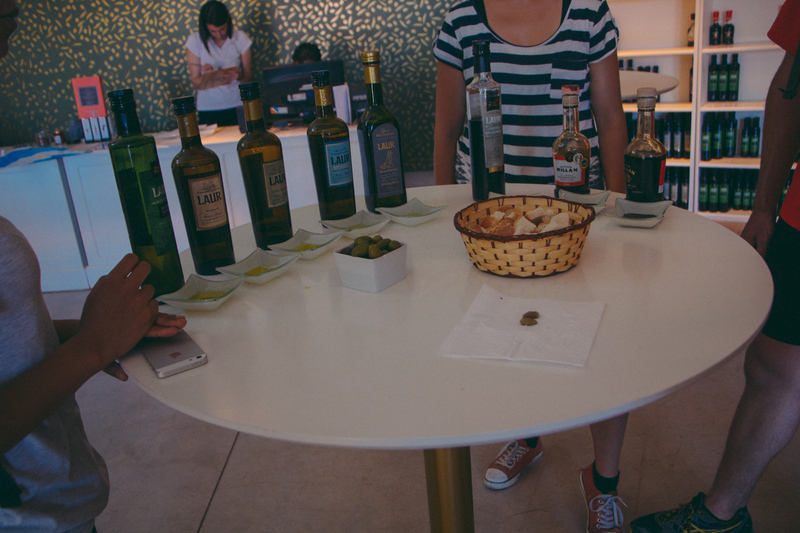 We tasted around 8 different olive oils and 4 balsamic’s, all were really delightful, especially with the fresh ciabatta – it helped soak up the first wine tasting of the day well. 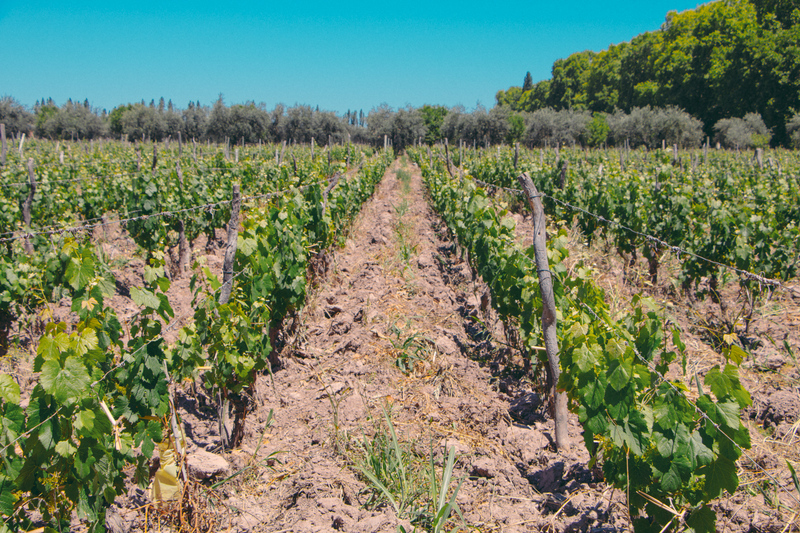 A 20 minute bike ride down the road and we were at Bodega Familia Di Tommaso, this was a larger scale vineyard with many traditional processes. 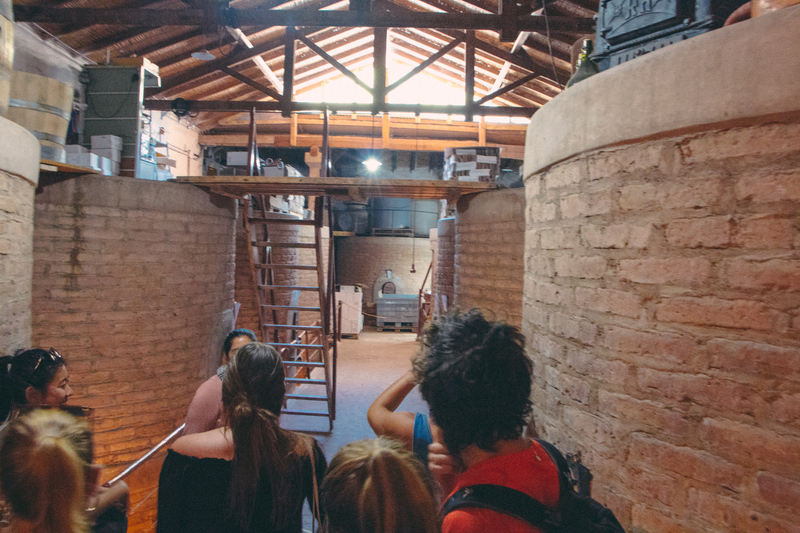 We first explored the many rows of grapes that had just started growing and then proceeded inside the building to inspect the huge concrete vats. Previously these were used to store the wine however now they only housed bottles of wine as stainless steel is now the preferred storage choice. These vats were so large at 20,000 litres that we actually went inside one and down a staircase, being told about the glitter like appearance the vat had. This shininess is called tartrate – a sign of a good wine as it shows the ageing process. In a traditional wine these glitter-like pieces can still be seen in the bottle and are apparently a way of knowing the wine has aged in a traditional process. We then tasted 2 more malbecs and 2 cabernet sauvignons, here each helping was very healthy, larger than a glass of wine you’d get in a restaurant. It was here we were told he proper way to taste the wine, swirling it looking for the drips (legs) that form on the side of a glass, the longer it takes the drip to fall the longer the wine has been aged, and then to note the colour — not done by looking at the wine, but by at the hue of red it casts against a white piece of paper when held to the light. Not being connoisseurs and after already having had our fair share of wine I couldn’t really tell a significant difference between a few of the aged wines but I’m sure they were notable. 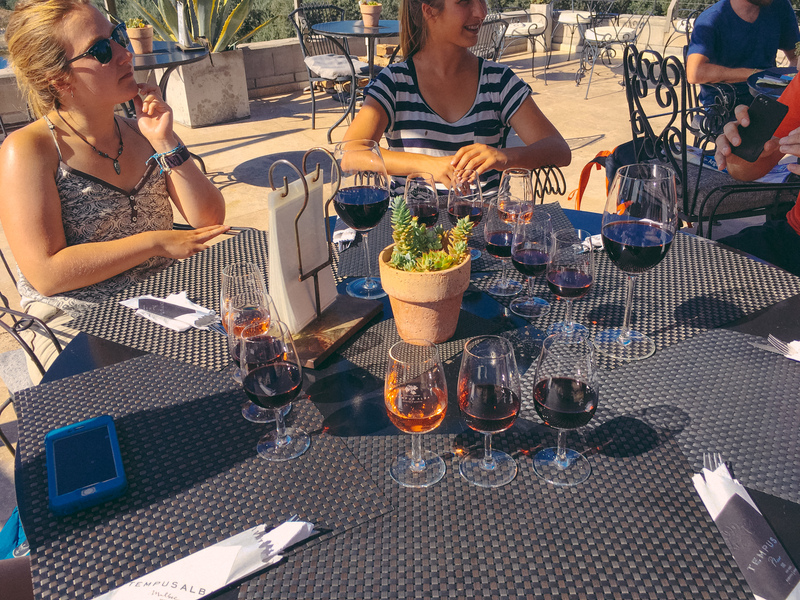 We proceeded to our final vineyard, Bodega Tempus Alba, where we decided to sample our wine tastings accompanied by lunch. 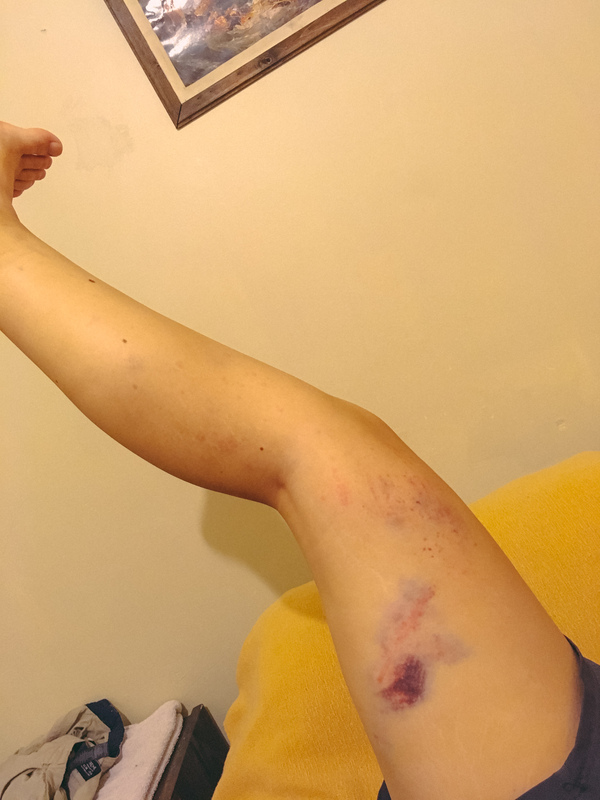 As we approached the building Alis causally fell sideways off her bike whilst trying dismount, a little too much wine I think! Lunch was lovely and having finished we all joked that we hadn’t even paid attention to these wines as we had been chatting and eating – we laughed that they may as well have all been served in one glass instead of several small ones for the amount we took notice. 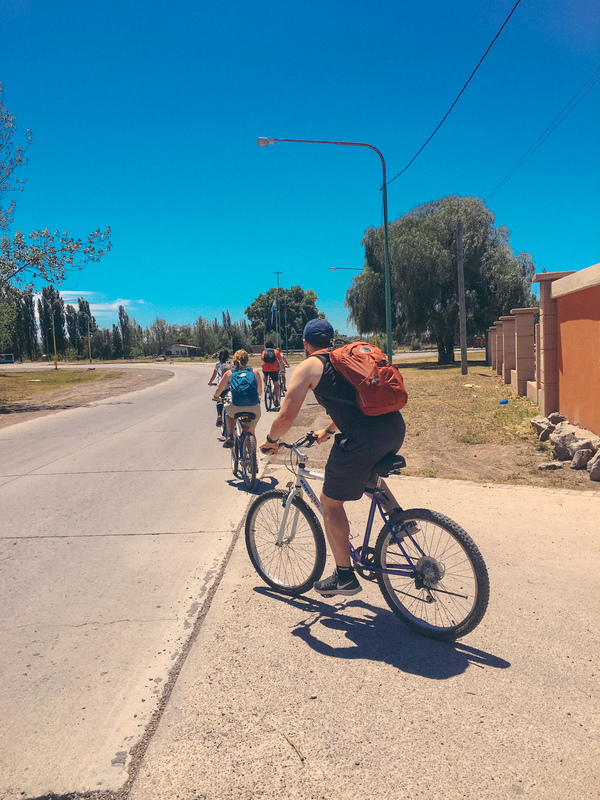 We returned our bikes after a 30 minute merry ride and popped next door to the cafe/restaurant that the bike store manager also owned, here we received free empanadas and yet more malbec! Not too long later we caught the bus back to our hostel and refreshed before heading out to find dinner. We finally found a simple restaurant that served vegetarian food for one of our group and had yet more wine and food! 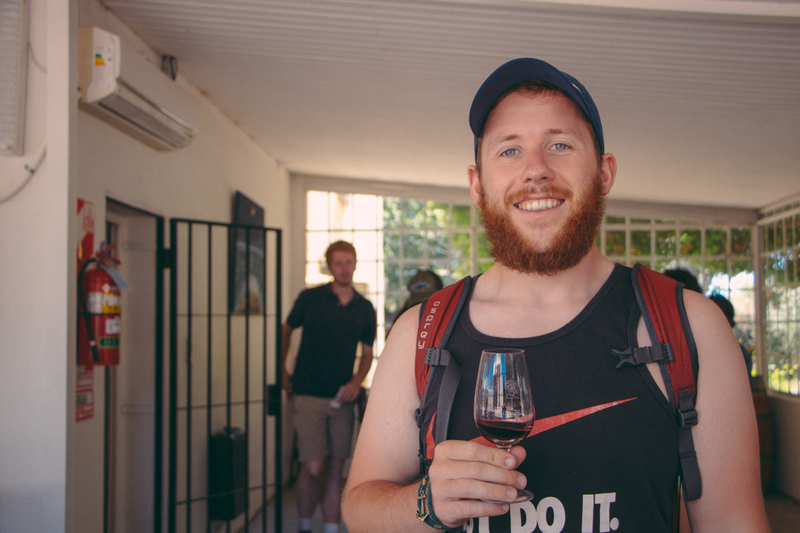 Finally the wine tasting day was over and we were back in bed asleep before we knew it, ready for the bus the next day to Salta.